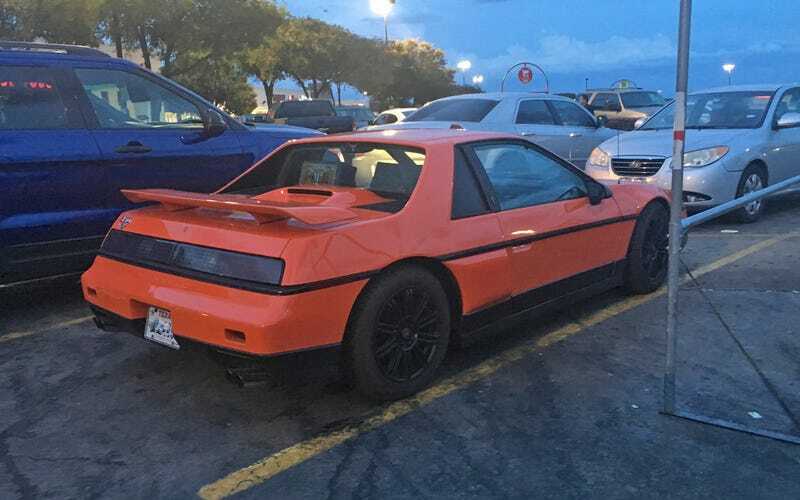 I was walking out to my car this evening when I saw and heard this bright orange Fiero pull into the lot. It did not sound like any Fiero I’d ever heard. I waited til the guy got out and I complimented him on the car. Then I asked about the throaty burble coming from the exhaust. He said, “Yeah, it’s got a 350 V8 in it.” I said, “Well, since that car weighs about 27 pounds, I bet it gets down the road.” He laughed and said, “It weighs a bit more, but yeah, it goes.” He was probably my age (50s), and was wearing some sort of car shirt. So he likely put the motor in himself. Note the “350" badge on the back.